Love the Salt Cave? Want to bring it home? We can do that too – from custom salt rooms, accent walls to fireplaces and headboards. Having a Hiamalayan Salt wall has become the latest trend in the commercial and residential construction all over the world. Reasons are diverse, from health benefits to spiritual healing. 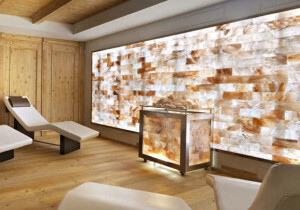 Himalayan salt lamps and walls are known to be the “Vitamins of the air.” Illuminated salt projects negative ions, which clean the air by fighting the positive ions from dust, electronics, etc. The studies show that illuminated Himalayan salt rocks help relieve allergies, asthma, COPD and a list of other respiratory conditions. 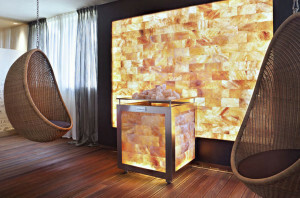 And now Columbia University studies show that Salt rooms help with depression, by increasing serotonin level. Call us or email us for pricing.